AMBERSTONE BXDN is a premium radial tyre featuring a specially designed for maximum life on mixed surfaces. This premium option has more tread depth and a heavier casing than standard HRL or L-3/E-3 tyres. 2* All-steel Radial construction provides better driver comfort on mixed surfaces. 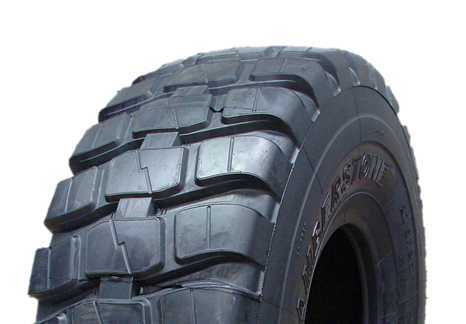 The “3 block” tread design with step down lug provides better forward and reverse traction. Tread design helps to clear mud build up and eject stones. Suitable for a variety of medium duty machines such as trucks, loaders and graders.